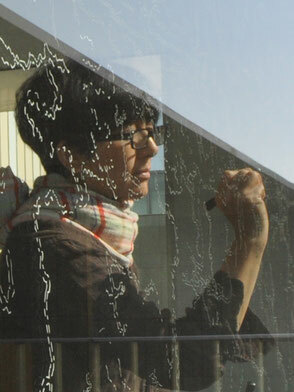 I draw points on the glass of the architecture from inside with following the view outside changing one moment by one moment. As folowing the time pass by.Then I create the fictitious map with the points line. The map to go somewhere. This is the work to try to touch the surface of 'the passing'. Regarded the glass as the membrane between inside and out of myself, I draw the map as scratching it. Sometime people do not realize that the map on the glass.They do not notice it because they looks only outside through the glass. However the map will spread rapidly in the field of view of the people who once "notice" it. "Notice" is important intent of this work.